Dr. Boylan joined Radiation Oncology Associates in 1987. She is the Chairman of the Department of Radiation Oncology at Potomac Hospital, and Medical Director of the Potomac Radiation Oncology Center, a joint affiliation of Potomac Hospital and the Inova Health System. While Dr. Boylan sees a variety of patients, she has a particular interest in the treatment of breast cancer, and multimodality therapy for lung cancer. 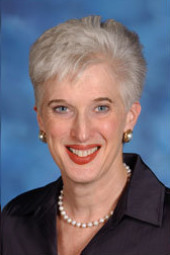 Dr. Boylan graduated from Franklin and Marshall College with a degree in Biology, and completed her medical training at The Georgetown University School of Medicine. She completed her internship and residency in internal medicine at North Carolina Baptist Hospital, Wake Forest University. She then continued her training in radiation oncology, also at Wake Forest University. 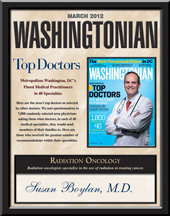 Dr. Boylan is board certified in Internal Medicine and in Radiation Oncology. It was a positive experience all around. I felt I had the best possible care anyone could want. Everyone was knowledgeable and professional. This staff made this journey of mine easier to bear. I am forever grateful. This was a very positive experience. Everyone was so friendly and helpful. Thank you for being so wonderful. The doctor, nurse and entire staff always took whatever time needed out of their bust schedules to help and advise me. Best doctor and ream ever!